Weather: It started out clear with a high haze developing through morning and overcast by evening. The temperatures hit the mid-60s at least. It felt like a summer day. Birds: There was a small mixed group of shorebirds at the South end of the park today. Among them were a Pectoral Sandpiper, Western Sandpipers, a Dunlin, and two Short-billed Dowitchers. While I was out at the park I heard what I think was a Pacific Slope Flycatcher, and Orange-crowned Warlbers. There were still at least a couple of Savannah Sparrows but their numbers have definitely declined in the last few days. There was at least a couple of Northern Flickers that were busy calling in the area around the house today. At one point in the late morning I even heard some drumming. One flicker was calling from the alder trees behind the house, before moving on towards the park. When I was out in the back yard watching the flicker, Rowan told me there was a bird over at the edge of the lawn. 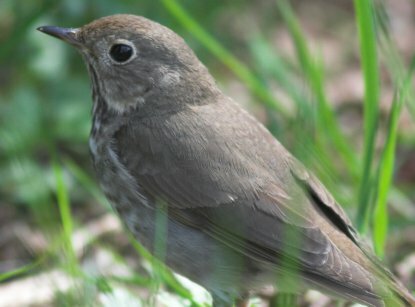 I walked over to see and it was a Hermit Thrush that seemed fairly tolerant of our presence. I was able watch it for a few minutes while it was foraging. Insects: The click beetles seem to have emerged. I saw a few of them today without even trying to look for them. The white butterflies are increasing in numbers and I also saw Morning Cloak butterfly. Flora: Plantain have started to bloom in the upper estuary meadow at the park. There are also black lily flower buds formed. Some of the green plants that grow on the very upper intertidal gravel flat at the park are starting to grow out again. This entry was posted in birds, daily, flora, kids and nature, photo, weather. Bookmark the permalink.